Professor Utpal Banerjee will present the 117th Faculty Research Lecture, one of the the UCLA Academic Senate's highest honors. The amazing advances made in mapping the human genome don’t alter one longstanding fact: When it comes to unlocking the scientific secrets of life, fruit flies rule. Hence the intriguing title of UCLA professor Utpal Banerjee’s upcoming lecture, to which the entire campus is invited: "Oncogenes, Metabolism, Development, Cancer and the Little Fruit Fly That Could.” Banerjee, the Irving and Jean Stone Professor and chair of the Department of Molecular, Cell and Developmental Biology in the UCLA College, will present the Academic Senate’s 117th Faculty Research Lecture on Monday, Oct. 6, at 3 p.m. in Schoenberg Hall. Scientists have been peering through their microscopes at Drosophila melanogaster — the biological name for a species of the common fruit fly — for more than a century. Easily cultured in the laboratory and blessed with a short life cycle that averages 10 days, fruit flies are a veritable mother lode for basic science. Promising that he’ll keep his molecular biology jargon to a minimum in his lecture for the benefit of non-scientists as well as scientists in other fields, Banerjee plans to share some of the exciting discoveries his lab has made using fruit flies. Take cell differentiation, for example. But usually it's not that simple. “In the growing human brain, with its trillions of cells, it is very difficult for each cell to keep track of its lineage,” he said. So cells figure out what they’re going to become by communicating with their neighbors. “Cells talk to each other and tell each other what to become developmentally. ‘You become a neuron’ or ‘You become a become a blood cell.’” This transduction of information comprises what scientists call signaling pathways that work individually and in combination to produce a wide range of outcomes. Years of study of these intricate pathways have yielded findings that help explain disorders such as cancerous cell growth. Banerjee’s research team also uses fruit flies to make breakthrough discoveries about how blood progenitor cells — cells with the potential to differentiate into all blood cell types — end up as one type of cell versus another. “This is a very important problem that many people study in mammalian systems — how our bone marrow makes different blood cells, why these cells often die, how they’re regenerated and so forth,” he said. Drosophila blood cells, called hemocytes, are major players in the fruit fly’s built-in (innate) immune system. While the human immune system is much more highly evolved — we also have an acquired immune system which enables us to develop additional immunity throughout our lives — the fruit fly’s ancient innate immune system lies at the foundation of our own. “Acquired immunity is important, but that comes on top of this first response,” explained Banerjee. “We also recognized that the fruit fly’s blood progenitors respond to several kinds of insults and stresses from the outside.” And this, scientists realized, could serve as a model to explore elemental questions about systemic control of blood cell development in humans. So far, Banerjee’s research team has observed how blood cell development in the fruit fly changes in response to stresses such as hypoxia (low-oxygen conditions), injury with a needle, starvation and even to odor. They’ve also discovered that if there’s a tumor in one part of the fruit fly, blood cells located in another part will react to it. 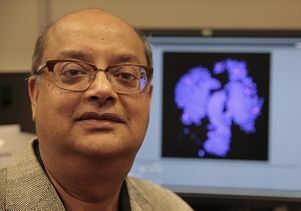 Widely recognized for his work, Banerjee was inducted as a fellow of the American Academy of Arts and Science in 2008 and, in 2009, he was named a fellow of the American Association for Advancement of Science. In 2010, he was elected director of the board of the Genetics Society of America. His influence also reaches into many realms at UCLA. In addition to chairing his department, he is co-director of the Broad Stem Cell Research Center, a member of the Jonsson Comprehensive Cancer Center and an affiliate of the Brain Research Institute. 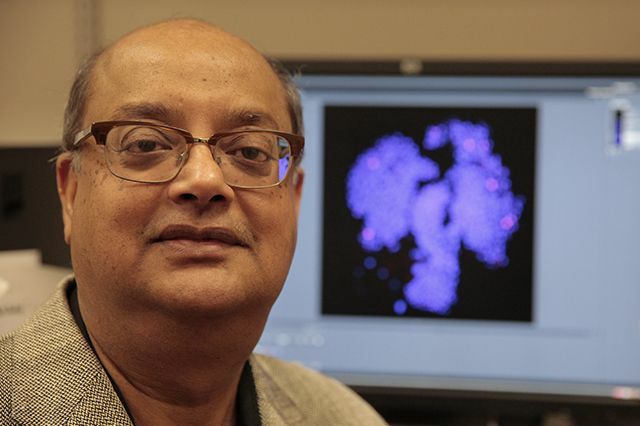 Banerjee is particularly proud of being named in 2002 one of the nation’s first Howard Hughes Medical Institute (HHMI) Professors, an honor for which he received a $1 million grant to improve undergraduate science teaching. He spearheaded an innovative approach that takes early-stage undergraduate students beyond the lecture hall and into a teaching laboratory to engage in hands-on, publishable research. 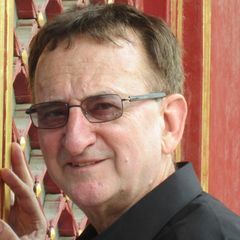 He has also implemented a new pedagogical tool known as research deconstruction, which teaches students how research findings lead to scientific knowledge. These new educational paradigms have been incorporated into UCLA’s curriculum, Banerjee said, and have significantly improved retention rates for students majoring in STEM (science, technology, engineering and mathematics) fields. The curriculum is regarded by HHMI as one of the leading educational innovations to come out of its grant program, and it serves as the basis for UCLA's Interdepartmental Undergraduate Minor in Biomedical Research, which Banerjee directs. Students with this minor take part in research in departments throughout the UCLA College as well as in the David Geffen School of Medicine at UCLA. Most have since gone on to graduate and medical schools. It’s all about getting students excited about science, including research in the basic sciences. “We cannot predict what will become useful and what will not,” Banerjee said. Studying the puny little fruit fly, for instance, won’t necessarily immediately cure cancer. Then again, it someday might. Banerjee’s Faculty Research Lecture, which is free and open to the public, takes place on Monday, Oct. 6, at 3 p.m. in Schoenberg Hall. A reception immediately follows. Find more information here.